@SmashedTransistors just tried those new objects, great! thanks so much for the bars and full scope mode!!! You killed an Axo board trying an OLED? No, not by adding OLED, it was something else. Dont really know what happened to the board. I have one more now that has got the "low output issue". I am thinking this one can be fixed by adding a resistor or something, I read about that somewhere. But again, I rally dont like to tinker with these things cause its so easy to break, if you dont know what you are doing. And I really don't, when it comes to the hardware side. I have very very little experience with building hardware stuff. I did build one of the Modular thing Axo control boards, which worked great........... for while. But after a while I started to get a lots of humming from the main output on Axoloti, so I had to take the Modular thing board off again and then the humming stopped. For the OLEDS I havent even tried. I got 5 of them, but I just cant get myself to do. If there was a video of someone who did the whole thing I would feel comfortable trying, but al the info is in bits and pieces, so havent really tried. What's the "low output issue?" Totally get that -- it's definitely scary screwing around with things you're unsure of when there's a chance of frying something. Do you have a breadboard and wires? Does my diagram from the other thread help? How's your soldering? The hardest part for me in this was moving the SMD resistor on one screen to get it readdressed. @spacelordmother thanks man I highly appreciate your effort. I am just really not comfortable with this stuff. But I got a freaking Weller soldering iron, which cost more than the Axo boards I want to solder on haha So I got the right tools, I think. But about my soldering skilles. Only think I really soldered was the Axo control board, which as you can read in my first description only lastet for a while, before it started failing, which resultet in humming on the output of Axoloti. The first badge of Axolotis had some issues that could cause the output to go almost mute. For sure! Had it not been for the kindness and patience of others I wouldn't be where I am... and I still have a looooong way to go! I think I have one of those suckers too, so getting closer. But ill check up on the breadboard, I think I have to buy it online and wait a while for it, cause my city doesnt really have any nice electronic shops that sells breadboards and stuff like that. I am mostly into the patching part, that I feel super comfortable about, cause its almost impossible to break that way, hehe That makes me feel safe experimenting with it. When I receivd my first Axoloti, i had not practiced soldering for many years. So I re-practice it on old electronic scraps (for example, an old non working remote control), before I do serious stuff on the axoloti. 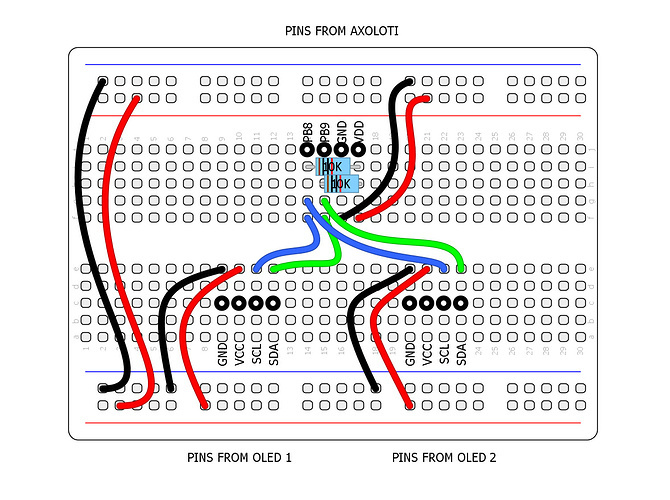 You should practice with the solder sucker before using it on the Axoloti. This should work with one instance per OLED display set on its i2c address. 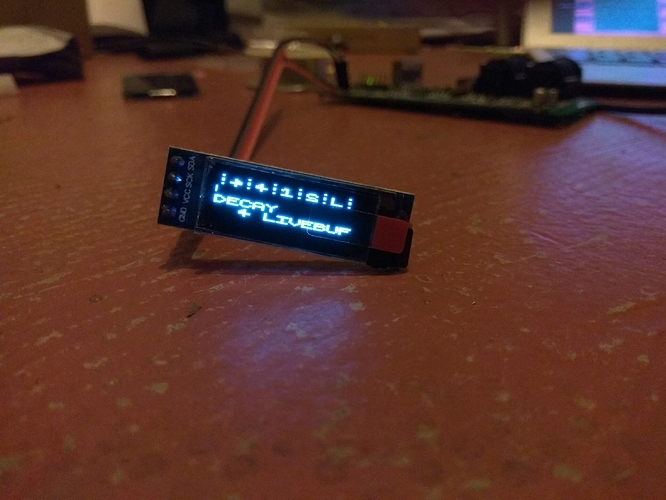 If you have troubles, you can describe what you do, i have a pair of 1"3 OLEDs and can try it at home. sorry, i was not very clear. the issue is with the display that has no address selector. i have a 0.91 inch 128x32 pixel here and it works as well with your library! the funny characters are a custom font, it's all as it should be. i kind of expected, that it would only display 2 lines, but it seems the two lines are internally scaled. hence my question: would it be much work to add a double size option? so that one line occupies two lines? the "1" and "2" positions near the connector have some SMD resistors connected either to Vdd or GND. So changing the 1 from Vdd to GND position should change the I2C address. The copper solder pad came loose from the board. I guess soldering smd resistors is not my thing. I hope the solution from the github topic will help you! I've ordered two new OLED screens with a simple address selector. i did that and it did not help. Wow that scaling on the 128x32 OLED is funny. I wonder if all 128x32 display behave this way. It will be a little tricky to hack the 128x64 OLED to scale up the characters. hmm, ok. i thought it would be about using the same text line twice, once the lower four bits x4, once the higher four x 4. the horizontal scaling could stay the same i guess. In the the 128x64 display, pixels are arranged by horizontal bands of 8 pixels (called pages). The 128x64 object I have written calculates each band according to the incoming strings or scope, thus i avoided the use of a complete buffer (sram2 is quite precious). That's why it can be tricky to modify it. can't you just read directly from the incoming strings, but only use half of the bits of your font and scale it up by factor 2 (once the upper half once the lower half) and the same for the second line. line 3 and 4 would be disabled of course.